I first came across, Nicole Y. Dennis-Benn’s debut novel, ‘Here comes the sun’, through writer, blogger and book reviewer, Anne Goodwin. Neither the book cover nor the title appealed to me at first. They both seemed too light hearted and brought to mind too many negative images around the ongoing political debate on Caribean tourism. Hence, I only skimmed through Anne’s review and, at the end, decided (to support the writer (something I regularly do) by (one day soon) picking up a second hand copy of the novel. Weeks later, during a discussion with Anne Goodwin on the novel, she asked for my opinion on it. I was engrossed in another novel at the time, but considered it and later, ventured a read. I didn't get into it until after the first couple of pages, but after that, I was hooked. I found Nicole Dennis-Ben’s writing style to be beautiful and refreshing; her characters true to life and the issues raised by the novel explosively ‘political’. My only disappointment was with the ending. But I’ll let you decide yourself what you think on that. Take my word for it, Nicole Benn’s ‘Here comes the sun’, is truly worth a read. Great news. I submitted one of my short stories, Saturday's Soup to The Mechanics' Institute Review (MIR) Online and I am happy to say that they've agreed to published it. I consider it to be one of my best short stories so far. Hope you get some kind of a stir out of reading it. As always, I would welcome your feedback. Three months ago, I decided to read a book by a well known award winning author. This book had been sitting on my shelf to many years and I chose to read it ‘for a change’ from the last two prize winners and chit lit books I’d been emmersed in reading. I really enjoyed reading my new selection and (as I often do) decided to search for other books by the same author. Yeepie! I was in reading heaven and ended up munching through three in a row by the same author. I loved his writing style. His plots were varied and interesting and as a writer I found myself learning a thing or two from his work. I was eager to reading his next novel and got stuck right in. Unfortunately, after reading the first few pages of the fourth in my selection, I started to lose interest. The story kept sagging. “Where’s this going?” I asked myself. “Give him the benefit of the doubt.” I plodded on. Everytime the story presented a slight upturn, I got excited, telling myself, this is it. Now we’re getting somewhere. But no. More than half way through and even when I was almost at the end, I still found myself counting how many pages I had left before I could put it down. As a serious writer, I have learnt to assess and reassess everything I read. So why didn’t I enjoy this read? I’m sure the author had his reasons for writing this novel and I could see some of the issues he was trying to raise, but the reading experience left me wondering why this book was published, when surely the publisher or agent knows this author could do better. He has a track record to prove it. Clearly I have more to learn about the publishing industry. What do you do when you find yoursef reading a book that isn't doing it for you? Do you continue reading inspite of it all? Or are you one of those people who simply put the book down and not recommend it to fellow readers? Do you give up on the author altogether and never pick up another one of their books? I'd love to know. Calabash Literary Festival, Jamaica - what a treat! 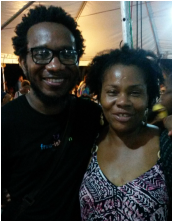 Earlier this month, I attended my first literary festival - Calabash, in Jamaica. 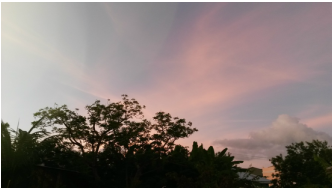 It took place over three days in the wonderful picturesque setting of Treasure Beach, St Elizabeth. The audience mainly came from Jamaica and the rest of the Caribbean, but participants came around the world. The numerous stalls at the entrance to the venue, displayed colourful crafts and and clothes and there was an opportunity to sample some Jamaican coffee. Food and drinks were also continuously available, of course. On day one, we enjoyed listening to Jamacian writers such as Nicole Dennis-Benn, whose debut novel, ‘Here comes the sun’, will be published this year. Award winning, Kaylie Jones, author of ‘Lies my mother never told me’ read some of her work, together with, Chigozie Obioma, whose first novel,‘The Fishermen’, was named as book of the year for 2015 by the UK Observer, The Economist, The Financial Times and others. ​Poets such as Ilya Kaminsky, Valdimir Lucien and Jessica Care Moore, performed some of their work. There might be some bias here, but I particularly liked Vladimir's poem 'Description of Articles', where he lists items we conceal in our suitcases when we are leaving the Caribbean for England. This poem had most of us in fits of laughter. The evening ended with a wonderful Roots Rock Reggae session, with reggae singer and songwriter, Protoje, as the main artist. In the ‘Movable Feast’ section, on day two, we were treated to poetry readings from Tishani Doshi, Nikola Madzirov, Ladan Osman and Kei Miller. Novelists included the Man Bookere prize winner, Eleanor Catton. Poet, novelist and political activist, Chris Abani (Nigeria/USA) sat in facinating reasoning (conversation) with Paul Holdenraber. I was particularly touched by his poems about his father. On the last day, we listened to extracts from the stories of the five finalists of the Commonwealth Short story competition for 2016. Then the final winner was announced. This year Parashar Kulkarni, from India, won the grand prize (£5,000). Well done Parashar. His story, ‘Cow and company’, also had the audience in giggles. The two popular open mike sessions allowed some people in the audience (mainly poets, due to the three minute limit) to perform some of their work. This really demonstrated just how many talented people are out there (most 'undiscovered'). I got the opportunity to read one of my pieces of flash fiction: 'An Okay Day'. Here are some pics (and a U-Tube link) I think you'll also enjoy. Parshar Kulkarni: Winner of Commonwealth short story competition 2016. Me with my country man: poet, screenwriter and actor, Vladimir Lucien. 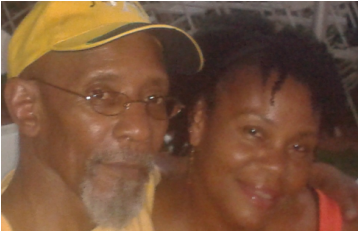 Me and one of my favourite dub poets: The master, Linton Kwesi Johnson who is the only black poet, to be published in the Penguin Modern Classics series. Check out this U-Tube link with Protoje and one of my favourite young reggae artists, Chronixx. Finally, if you're looking for a good read, you might want to take a look at the work of some of the authors who attended the festival. The Calabash Literary Festival takes place biennially. Admission is free! ​I know one person who's not going to miss it in 2018. I know it’s been almost a year since my last blog post, but trust me, I have been busy. Life’s trappings wrapped me up and I am just about beginning to disentangle myself. Anyone who knows me knows that although I am a night bird, I also love my sleep. However, my fingers are hot to tap and my determination and creative juices oozing. 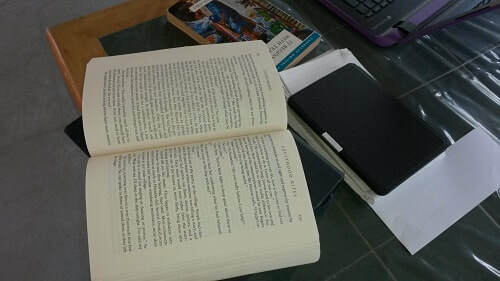 I have to complete the second draft of my novel, ‘A Woman like Doli’. To help me achieve this I have set myself a challenge: to wake up at 4.00 every morning (Monday to Friday) and write for two hours before having to face my domestic tasks. Of course, I plan to top this up by squeezing in more writing time during the day. I had to read this section again, just to confirm that the second sentence was really that long and to immerse myself in the language, style and how they hung together. It worked for me and, in fact, grabbed my attention more, even though I know most writers would try to avoid such long sentences, for fear of losing the reader. Nella Larsen was of dual heritage. Her father was from one of the Dutch colonies in the Caribbean and her mother was Danish born, so it isn’t surprising that both stories have a theme of identity and race running through them. You can read my review of both stories on the New Black Magazine’s site, by clicking here.